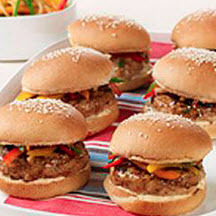 CooksRecipes has quality, kitchen-tested recipes for chicken hamburgers and cheeseburgers that you can count on for successful deliciousness. Outrageously good! 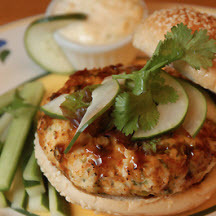 Chinese-style chicken burgers are topped with a colorful pepper, snow pea and jicama slaw and a fiery Sriracha lime mayo. 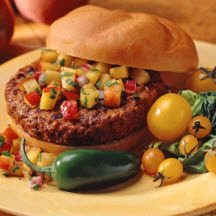 Topped with zesty peach and nectarine salsa, these tasty chicken burgers will have your taste buds doing the Cha-cha-cha! Created by Kristine Snyder from Kihei, Maui, Hawaii, this recipe was the winner of the 45th National Chicken Cooking Contest in 2003.